Congratulations, mama! You made it. Well, almost! You don’t have to tell me how brutal the waiting game gets in the third trimester– I’ve lived it and I know, it’s tough! One of the things that kept me going and helped pass the time that seemed to stand still was to tackle my to-do list. Nesting is real and when it hits, nothing is safe (not even that junk drawer you’ve added to for the last three years). To keep you focused, here’s a guide to help you understand your last trimester and be as prepared as possible with a full checklist of items to cross of your list in your last trimester! How many weeks in the third trimester of pregnancy? Technically speaking, the third trimester begins on your 28th week of pregnancy and lasts until you deliver, which is typically around 40 weeks. However, many first time moms do go past their due date, so if you’re patiently counting down the days to meet your sweet little one, you may have to practice just a bit more patience! I personally went 10 whopping days past my due date, so if you’re reading this late in your pregnancy, trust me, mama–I feel your pain. It’s time to get moving on that I-better-do-this-before-the-baby gets-here-list. 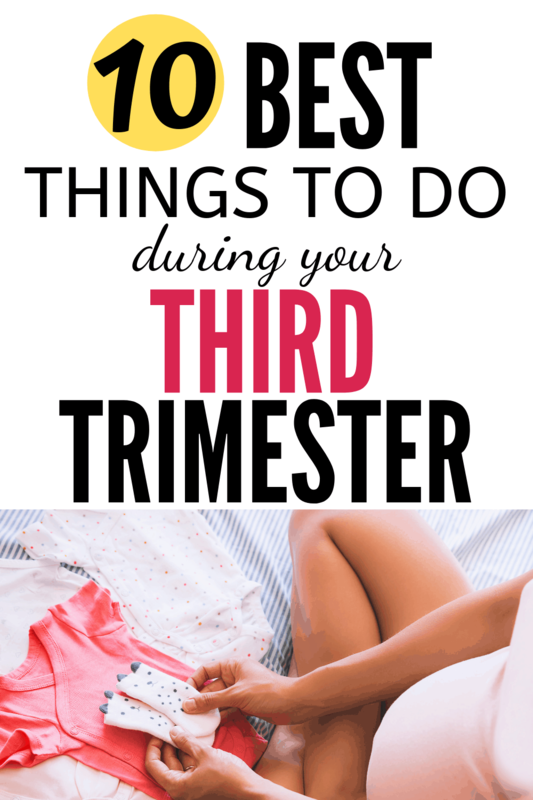 And if the thought of that already sounds overwhelming, here’s my ultimate third trimester to do list that will get you completely ready to welcome and care for baby. There’s a lot of decisions to be made about what you want to happen in the delivery room. And rather than trying to communicate your wishes between contractions, go ahead and make a birth plan. Whether or not you’d like music playing, lights dimmed, etc. I signed up for a breastfeeding class at my local hospital but was disappointed after i finished the course– it was short, overwhelming and I couldn’t go back and reference any of the info. One of my friend’s suggested the Milkology breastfeeding course and it was a total game-changer for me. The course is super affordable, can be watched at home in your jammies (yay!!) and is available to you forever. I even referenced the course many times after my baby was born and that was so, so helpful. If you’re considering breastfeeding, I highly recommend taking a course to prepare! Postpartum is no joke. And unfortunately for many first time moms, it seems like most are unprepared for postpartum recovery. Take my advice and stock up on necessary supplies to help with post-birth healing now! If you haven’t read about postpartum recovery healing tips and tricks, I encourage you to read this informative post. Trust me, mama, the more tools and knowledge you have going into your postpartum period the quicker you will recover! If you attend childbirth classes they’ll go over in detail how to count your contractions (if you haven’t already signed up to attend childbirth classes at your hospital, I highly recommend it!). Our class instructor told us to use the chart in the back of the workbook to keep track of our contractions when the time came, but let me tell you, when those contractions come, it’s way easier to hit just a stop and start button! I used the Full Term contraction timer, but there are tons of free apps to choose from. Go ahead and put that app on your phone, now! Because I used the contraction timer I was able to labor at home longer since I was keeping a very close watch on my contractions and knew when it was go time! There’s no way you’re going to want to be on your feet after you return home from the hospital, and rather than eat out for a month straight, why not make some freezer meals ahead of time! For me, the easiest way to prepare meals was to just double something I was making anyway. I started this process during the beginning of my third trimester and had a freezer bursting at the seams by the time we returned home with baby. If that process doesn’t suit you, I know many people that choose one day and knockout as many meals as possible– just pick whatever method works for you. Don’t skip this step– having prepped meals was an absolute godsend for us. Between my prepped meals, and meals others had prepared for us I didn’t cook for about 2 months! You’ll go through a ton of baby clothes– between blowouts, spit up, dried milk or whatever, you’ll find yourself changing baby’s outfit a lot. Get ahead of the laundry and go ahead and wash all of baby’s clothes and sheets now! You can’t leave the hospital without having the carseat installed and since labor could catch you off guard, it’s a good idea to scratch this item off your list early in your third trimester. Warning, some of these car seats can take a while to set up– just reserve a Saturday or Sunday morning to get this set up. Once you’ve installed the car seat (don’t forget to put one in your husband’s car, too!) drive on over to an inspection center and make sure it’s installed correctly. Here’s a list of inspection places, state by state. Pre-registering at the hospital is something that never occurred to me, but luckily I had a friend who had recently given birth and she passed along this pearl of wisdom to me! Going ahead and pre-registering at the hospital before time really saves you a lot of time when you actually do show up to deliver your baby. I recommend calling your hospital and asking them how you go about pre-registering and then getting some details like: When I’m in labor which entrance should I come in? (there will usually be one entrance for am deliveries and one for pm deliveries), where can we park our car, etc. Another item you want to cross off soon after you pass that third trimester mark. Packing your hospital bag when your in labor is no fun–so go ahead and get that out of the way too. Don’t forget to pack baby’s bag and dad’s bag, too. If you aren’t having your shower until the third trimester, wait until after that’s done to get any additional necessary baby gear. I hardly bought any clothes for my little girl because I knew I’d get a ton from my shower, and I was right, people love to give baby clothes. Most places that you register with will offer you a pretty decent coupon to finish the items on your registry, so if you didn’t receive some essentials make sure you use that coupon to finish up your shopping. Also, if you aren’t already, I highly suggest becoming an Amazon Prime member (sign up here to get your first month free)! Our membership has paid for itself a thousand times over. I even ordered stuff from the hospital bed that I just knew we’d need after meeting our little girl! Having Amazon Prime also saved me from running out to the store to get toiletries and household essentials– I’m pretty sure it’s one of the best things to ever happen to new mamas! I stressed and stressed about getting the nursery perfect and guess what? My sweet little baby spent the first several months in our room in her bassinet. We were only in her room to change her or to rock her. All that to say, if having an instagram-worthy nursery is too overwhelming, don’t stress. It doesn’t need to be perfect for baby and it’s likely that baby won’t even spend the first several months of their lives in that nursery, either. Before you can leave the hospital to go home they will require that you set up your baby’s first visit with their pediatrician. Go ahead and do some research now on pediatricians in your area. Did you know most pediatricians’ offices also let parents-to-be tour their facility and ask questions? You’re going to be visiting your child’s pediatrician a lot in the coming years and it makes sense to choose someone you trust! Save the pediatricians number in your phone and be ready to make the call before you head home from the hospital! Did you know only 15 percent of women experience their water breaking before labor? However, if you are one of the 15 percent or if your water breaks on your way to the hospital– you’ll want to be prepared! I would suggest making sure you’ve got a towel in your car and a waterproof mattress pad protecting your mattress. Don’t forget to spend time pampering yourself and taking care of necessary appointments you might not have time to get to in a while! If you haven’t already, I recommend a prenatal massage— it works wonders to reduce swelling and you’ll walk away feeling so relaxed. Don’t forget to schedule things like dentist appointments, haircuts, oil changes, etc, too! What isn’t hurting in third trimester?! You may experience Braxton hicks contractions if you haven’t already. Essentially, Braxton Hicks contractions work to naturally prepare your body for labor. Typically you’ll feel a tightening in your uterus. You’ll want to discuss your Braxton Hicks contractions at your next prenatal appointment, as it’s important to keep your doctor informed of symptoms you’re experiencing. Note: Braxton hicks contractions are not real labor contractions, but it’s important to know the difference between them. Call your doctor immediately if you think you are having real contractions. Tips to help with braxton hicks contractions: Drink lots and lots of water! My doc encouraged me to drink at least half of my weight in water each day. You might be plagued with lower back pain. Relaxin is the pregnancy hormone that’s responsible for loosening your joints, which can lead to lower back pain. Tips to help with lower back pain: Apply mild heat to the area. My doc said using a heating pad on a mild setting was perfectly fine, but please make sure to check with your doctor. And remember, never apply a heating pad to your belly! You might feel winded. Besides the constant fatigue, you’ll likely feel winded after a short walk or walking up a flight of stairs. Tips to help with feeling winded: Make sure to take it easy, a moderate amount of exercise is healthy, but you need to take it easy! Try to eat healthy foods too, to fuel your body and help with fatigue! You might experience heartburn. As your baby grows and grows, your stomach gets pushed up– which leaves you with the unfortunate feeling of heartburn. Tips to help with heartburn: Eat smaller meals and try to sit upright for at least 30 minutes after eating. My doc encouraged me to sip water slowly during meals to help, too. You can also ask your doc about taking medication to help with heartburn. I took zantac when my heartburn was really uncomfortable and it really helped! You might have swelling in your legs and feet. Edema is the swelling that happens during pregnancy when your body increases fluid retention to nurture your growing bump. Tips to help with swelling: Avoid standing on your feet for long periods of time and try to elevate your feet above your head each night. Light exercise and making sure to drink lots of water also helps, too. During pregnancy, your pelvic floor muscles are weakened. In our labor and delivery classes, my instructor encouraged us to do kegels several times a day. She said kegels helped strengthen your pelvic floor muscles, allowing you to have better ability to control your muscles during labor. If you’ve never done kegels before, here’s a great guide to get you started. You can practice kegels anywhere, since no one can see that you are doing them. I tried to always do them at red lights. Besides helping to keep your weight down during pregnancy, walking has so many amazing benefits for pregnant mamas. Regular walking keeps blood pressure down, which lowers your chance of getting preeclampsia– a condition caused by high blood pressure and elevated protein in urine. Walking also helps keep stress at bay, keeping you and baby healthy during pregnancy and might also help you have a shorter labor– can’t argue with that! Squats are amazing for pregnant moms as they work to open up the pelvis–which really helps prepare your body for labor too! My labor and delivery instructor encouraged us to squat several times each day to get our bodies in the best state for delivery. Thanks for including that how to squat video! I’ve read other blog posts that talk about doing squats during pregnancy, but they haven’t shared how to do them correctly!